We still haven't gotten over the shock of Robin Williams' tragic suicide at his California home on Monday. Perhaps we never will. The Mouse Castle sends its deepest sympathies to Robin Williams' family, friends and all those affected by his death. His fans were many and we count ourselves among them. He is irreplaceable will be greatly missed. In the latest episode of Inside the Mouse Castle, Anthony and I devote the entire show to looking back at Williams' stellar career. We celebrate his incredible and unique talent, his rapid-fire wit as a stand-up comedian, and his surprising depth as a serious (and Oscar-winning) actor. We'll talk about Williams' great films like Dead Poets Society, Good Morning, Vietnam and The Fisher King. We'll even touch on a few clunkers like Toys and Death to Smoochy--I'm sorry, Anthony. It's just not a good film. 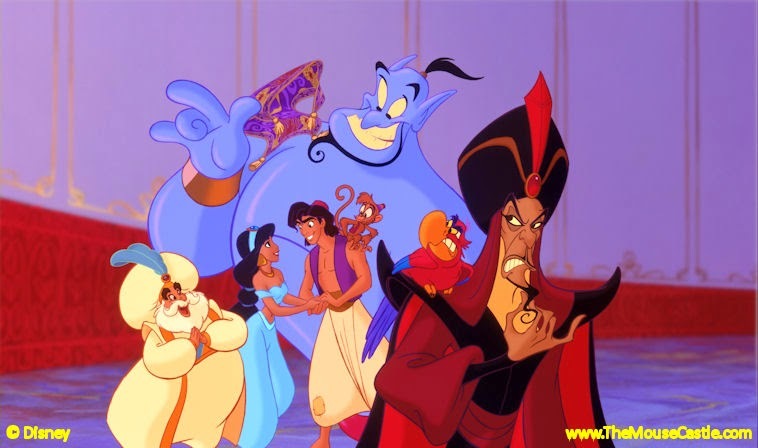 And, of course, we'll journey to Agrabah and remember Williams' sublime voice work as the Genie in Aladdin. We've never had a friend like him before or since. It's a very special episode devoted to an entertainment genius the likes of which we may never see again. Enjoy.